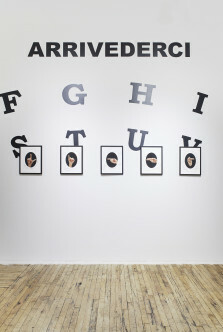 Esther Schipper is pleased to announce Wiebke Siem’s first solo exhibition with the gallery. 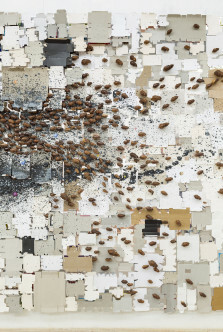 Under the title Damenskulptur, the artist presents seven new textile works and a series of new drawings. 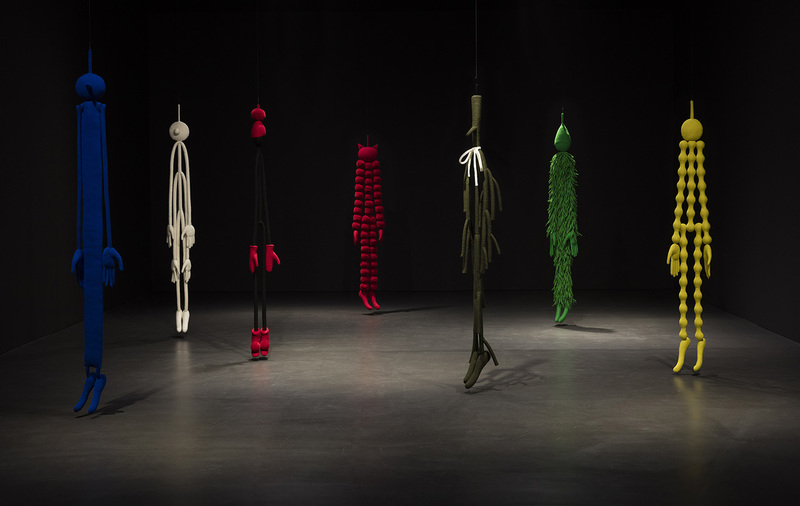 The new sculptures, made of soft knitted fabric and more than two meters long, hang in the exhibition space. Each consists of basic geometric shapes in different variations. 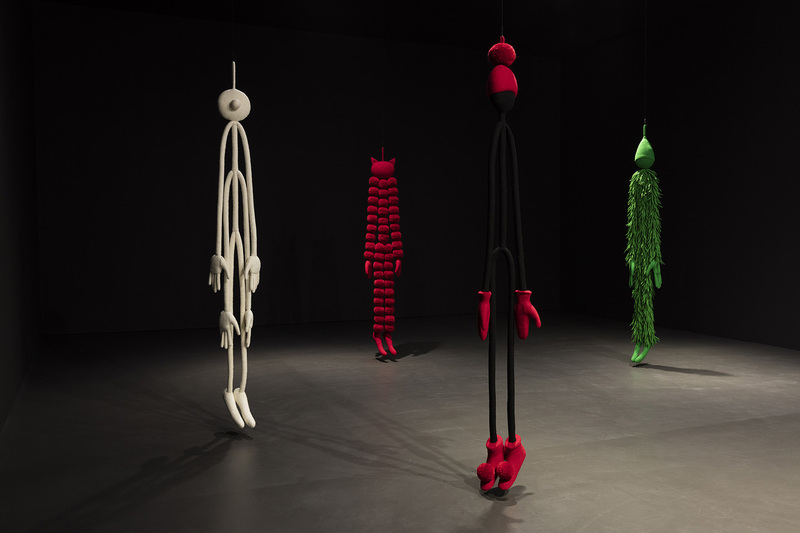 The forms of the pompons or fringes refer to the history of modern sculpture (especially the Bauhaus and Minimalism), while the figurative elements such as head, hands or feet counteract this serial arrangement at the same time. 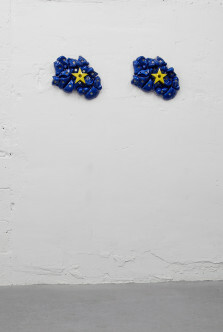 The new series also explicitly refers to Siem’s early works and combines motifs from the artist’s sculptural iconography with formal elements from fashion. For example, Siem takes up the surrealistic designs of Elsa Schiaparelli. At the same time, the new series also revisits the topic of the usability of works of art. The drawings indicate this potential for the usability of these Soft Sculptures. They show the sculptures in their full length, as well as a scarf draped around the outline of a neck. 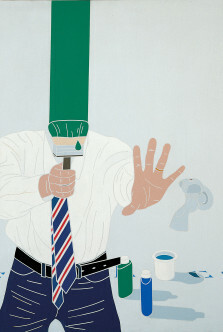 The juxtaposition emphasizes the humorous side of the objects. is evoked – although all associations are not mutually exclusive, especially in the work of Siem. 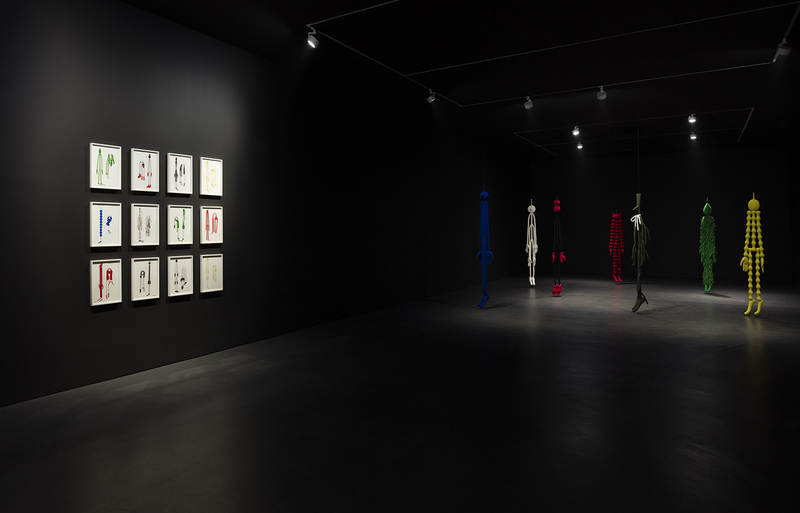 At the same time, the placement of the sculptures in the darkened room recalls a stage, especially the black stage of Oskar Schlemmer’s Triadic Ballet. 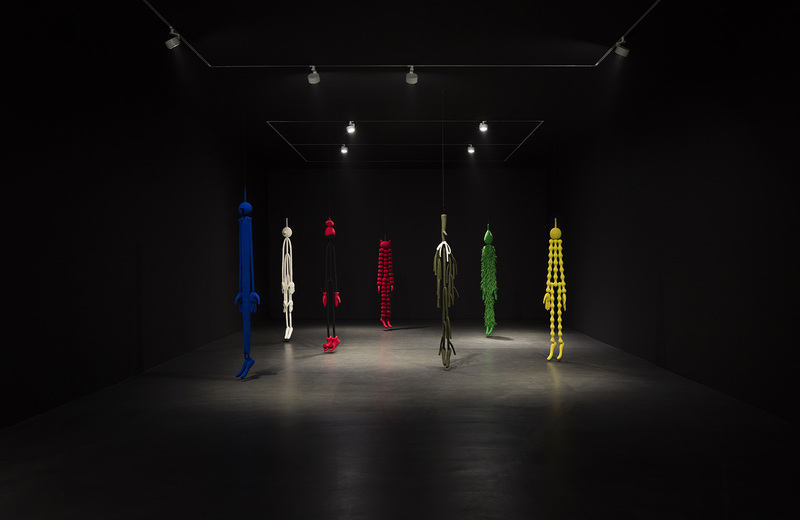 Starting from the history of fashion, art and design, Siem creates sculptures that address the legacy of modernism from a feminist perspective. Esther Schipper is pleased to announce Ich Rede zu Dir wie Kinder reden in der Nacht, Ann Veronica Janssens’ fifth solo exhibition with the gallery. Janssens—who has borrowed her title from one of Rainer Maria Rilke’s letters to his muse and lover Lou Andreas-Salomé: “I talk to you as children talk in the night”—will present for the rst time in Berlin a new indoor iteration of her iconic mist installations. 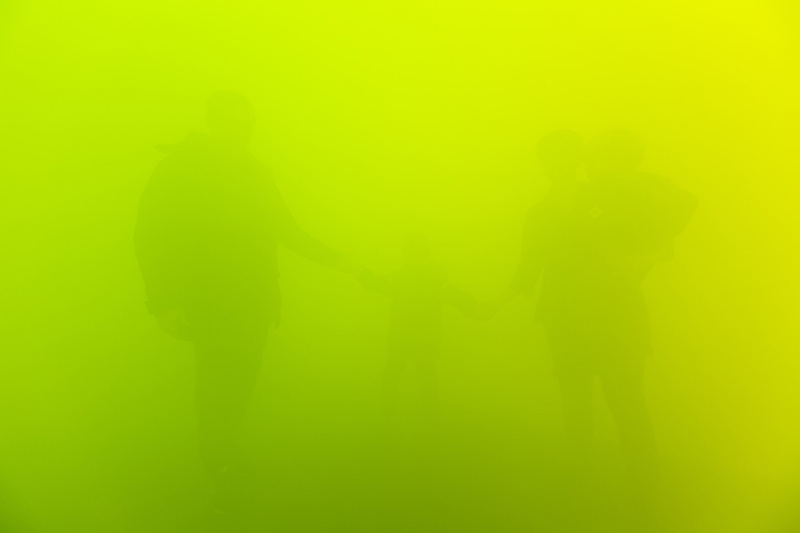 Once visitors pass the threshold of the exhibition space, they will find themselves immersed in a room filled with thick mist bathed in a combination of natural and artificial light, moving into an immaterial colored abstraction in green, yellow and pink, where any spatial or temporal landmark has disappeared. With this immersive environment, Janssens pursues an artistic experiment started in 1997 with MuHKA Antwerp, her first white fog room conceived on occasion of her exhibition at the Museum of Modern Art in Antwerp. Since then, the artist has created a number of mist installations, either monochromatic or multicolor, using natural or artificial light. 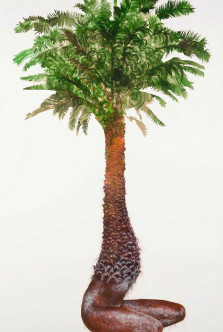 Since the late 1980s, Janssens has developed an artistic practice based on light, color, and natural optical phenomena. She continuously experiments with the characteristic attributes of carefully chosen materials (glass, mirrors, aluminum, artificial fog), shapes, and light, wielding our perception of reality to create a recurrent vocabulary of minimalist motifs and beautiful colors. 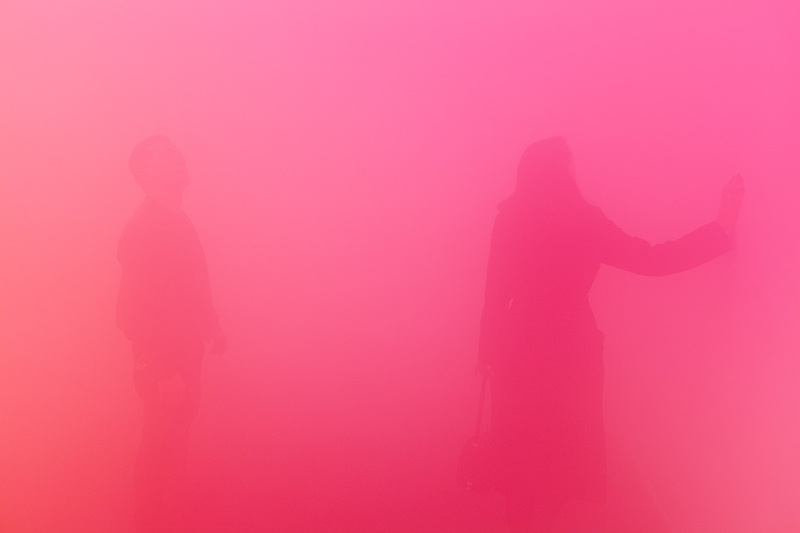 Janssens’ fog installations place visitors in an unknown territory where senses of vision and audition cannot be trusted anymore. 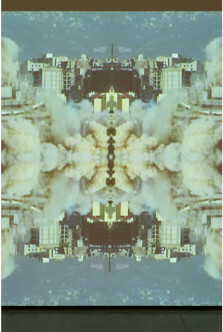 As explained by the artist: “Gazing at mist is an experience with contrasting effects. It appears to abolish all obstacles, materiality, the resistances specific to a given context, and at the same time, it seems to impart a materiality and tactility to light.” The experience provokes different reactions: some find it exhilarating, while others might experience dizziness or anxiety. By filling closed spaces with a haze of colored artificial mist, Janssens creates situations confronting visitors with their own perception of space and themselves in it. In 2001, as part of her solo exhibition at the Neue Nationalgalerie in Berlin, the artist presented Blue, Red, and Yellow—a rectangular “mobile sculpture” shaped like a standard container—on the plaza of Mies Van der Rohe’s modernist building. 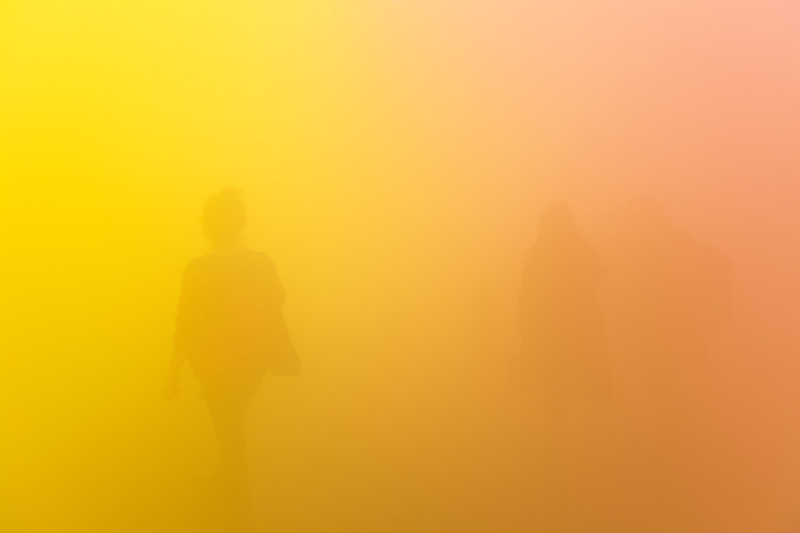 Each side of the pavilion was covered with a different color lm (red, blue, yellow, and transparent), while inside a fog machine filled the space with mist. 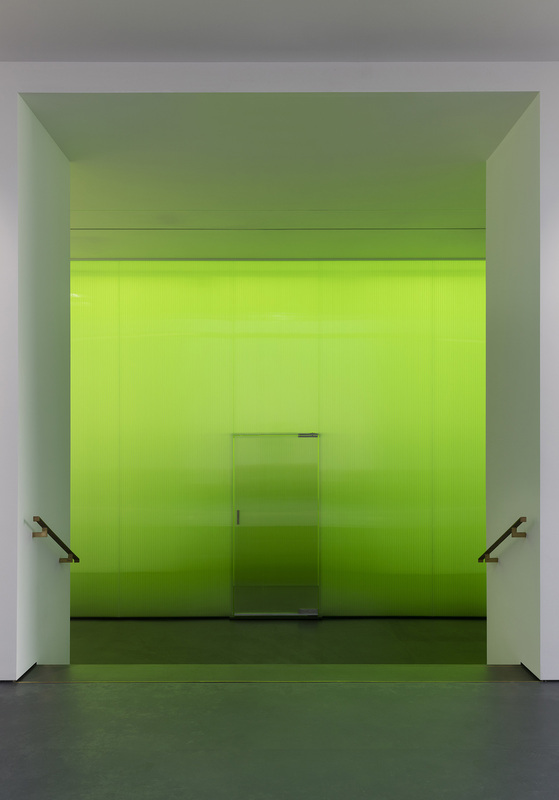 The work was one of the first colored fog rooms created by the artist and was reiterated on occasion of Janssens’ major 2016 exhibition at the Nasher Sculpture Center in Dallas.